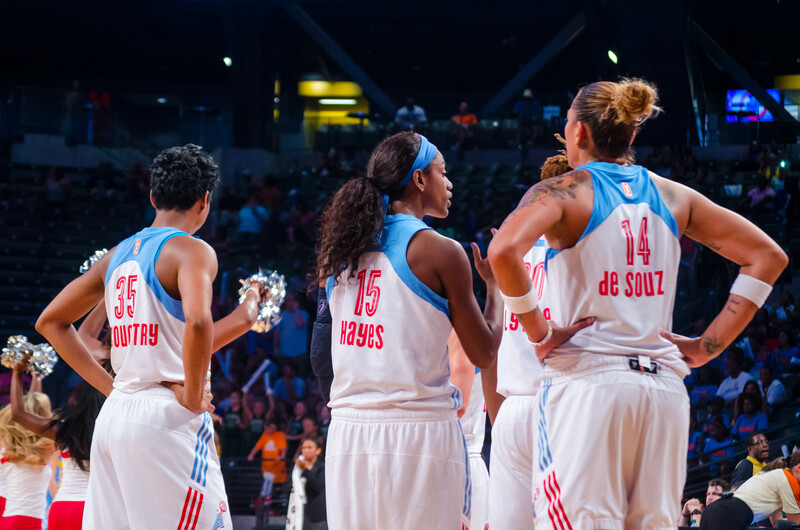 On Friday, July 25, the Atlanta Dream faced the Chicago Sky. The Dream are coming off a 2-game losing streak and hoping to turn things around. The Chicago Sky won their last game and will need to keep the trend alive, as they’re sitting in last place in the Eastern Conference. 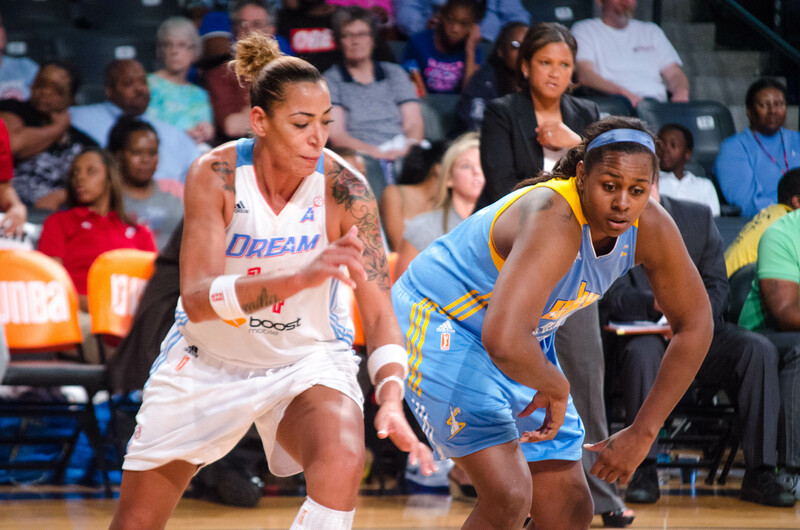 The Dream are currently in first and will want to create more space between those top 2 spots (between them and the Indiana Fever). The 1st Quarter didn’t go well for the Dream. It started with a 12-2 run by the Sky and ended with a 16 point lead (26 – 10 in favor of the Sky). 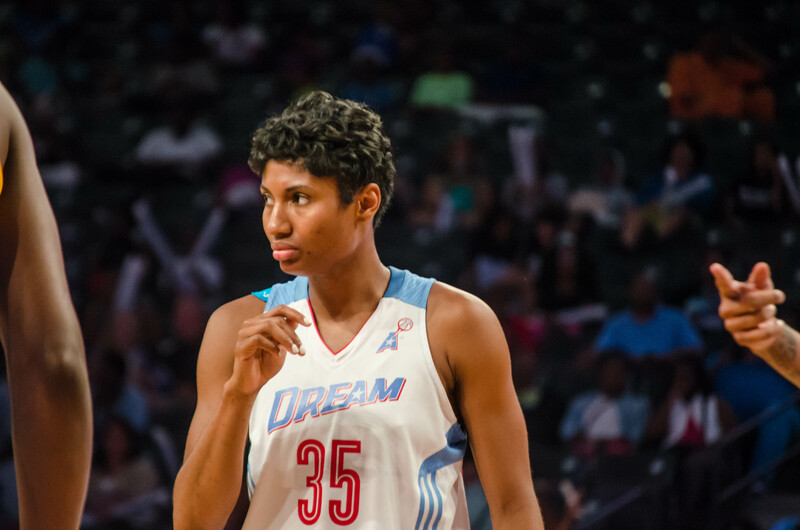 The Dream needed a big game from Angel McCoughtry but she struggled in the 1st half with only 6 points and 5 turnovers. Shoni Schimmel was substituted into the game to a thunderous applause. Probably because she was voted the WNBA All-Star game’s MVP. The Sky were on a roll in the 1st half with scoring coming from team leader Tamera Young with 10 points, 1 steal, and an assist. Jessica Breland and Sylvia Fowles both had 8 points, with Fowles holding steady on defense with 4 steals. The 2nd half ended with the score 43-29 in favor of the Sky. For a team that was 9-14 and sitting last in the Eastern Conference it seemed they were taking the first place Dream to school. Now the 3rd Quarter looked much better for the Dream. Although the points-gap was still wide (47 to 61), the 2nd half told a better story than the 1st. McCoughtry now had 10 points and 4 steals with help from Tiffany Hayes (10 points) and Aneika Henry (9 points). Chicago’s Allie Quigley was leading her team with 13 points, 5 assists, and a steal to end the 3rd Quarter. While the Sky’s biggest lead was up to 18, the Dream continued to bite away at that lead and bring the game within 3 points. The only thing stopping them from tying or taking the lead at this point late in the game was foul trouble. They couldn’t keep Chicago away from the line but in their defense, they were getting called on some petty fouls with under 5 minutes left in the game. The teams continued back and forth with scoring but the Sky just couldn’t grow their 3-point lead. With 15.8 seconds to go and down by 3, the Dream had time for 1 play. With that, they ran a play that setup Shoni Schimmel with a good look from the 3-point line. With an off-balance shot, the ball had promise but rolled out of the rim, ending any chance for the Dream’s comeback. 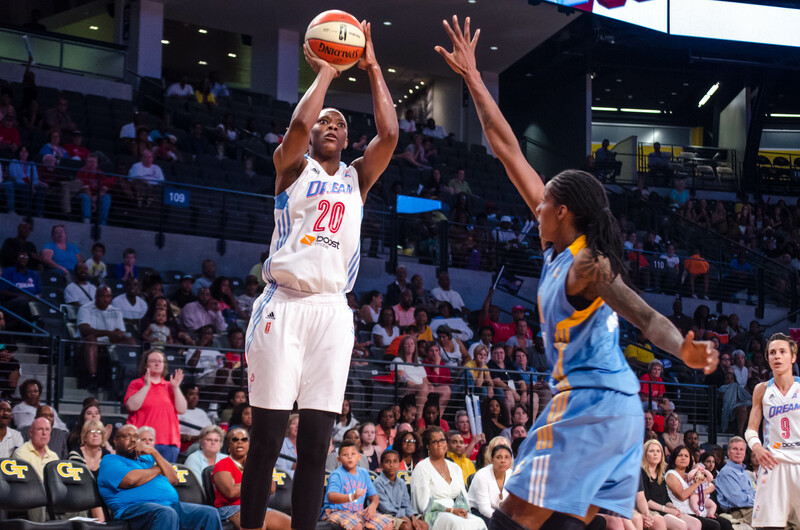 Epiphanny Prince led the Sky in scoring with 21 points to help defeat the Atlanta Dream. The big difference was made at the line. Prince went 8-9 from the free-throw line and teammate Allie Quigley went 7-8. Tiffany Hayes led the Dream in scoring with 15 points, 4 steals, and 7 assists. Sancho Lyttle had 15 points as well and led the team with 9 rebounds. Their next home game is Tuesday, July 29 against the Connecticut Sun at 12pm. Now you want to talk about fun? 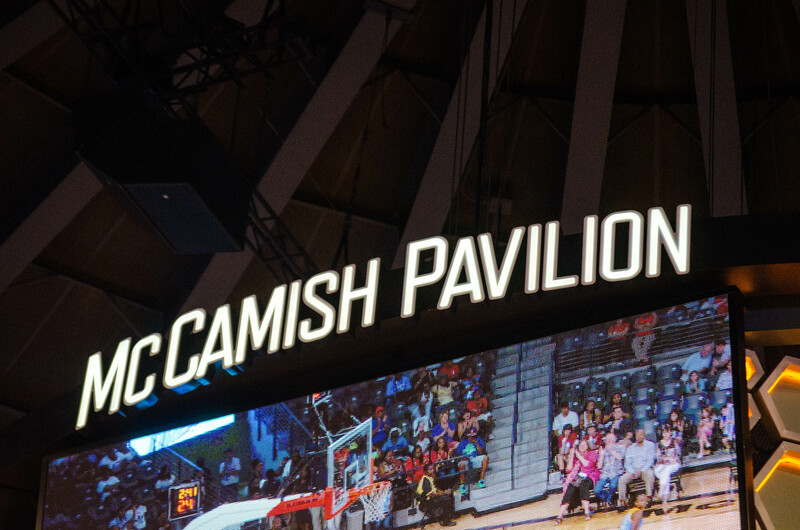 The Dream recently had a 3-game stint at Georgia Tech’s McCamish Pavilion which has a more intimate feel (the arena’s design makes it so there’s no bad views and you feel much closer to the floor) than most venues. Going to a Dream game is not only fun, but you’ll be happy in what you’re getting for your money. Players never hesitate to sign autographs when they’re around, the team is always promoting a good cause (this go-round its “Dream Pink” along with Grady Healthcare to fight breast cancer), and team merchandise is fairly priced. With constant giveaways throughout the game, upbeat music, and a noticeably great time for kids, it’s a nice change from the ordinary Atlanta roundup (Falcons, Braves, Hawks). The Dream return to Philips Arena next Tuesday to face the Sun, in what’s sure to be a great outing for the kids (one of their more heavily attended games by children hence the 12pm start time). Even though we lost, the girls played a great game and are still in first place. We’ll be bringing you more from the Dream this season as they start to prepare for the playoffs.